Acute ascending AD remains a catastrophic disease that is liable to be missed or have a delayed diagnosis. With such diverse manifestations, the diagnosis in any atypical case is even more difficult and mortality rates are unacceptably high. We reported two cases of acute AD presenting with different manifestations. The first one was a typical Standford type A case, a 71-year-old hypertensive man presenting with chest pain and syncope. With the high risk predictors and delayed operation, he died from cardiac tamponade. In contrast, the second case was an atypical one, a young man who had no known risk factors for developing AD. He initially presented with upper back, leg pain (Standford type B) and later congestive heart failure from severe aortic regurgitation. He survived the complex aortic repair and valve replacement but the cause of AD remained unknown. We hope that these two reported cases will raise awareness of this lethal disease in clinical practice. Chest film showed widening mediastinum with cardiomegaly, 1B: ECG illustrated sinus rhythm with occasional PAC, mild ST depression in V5-6. 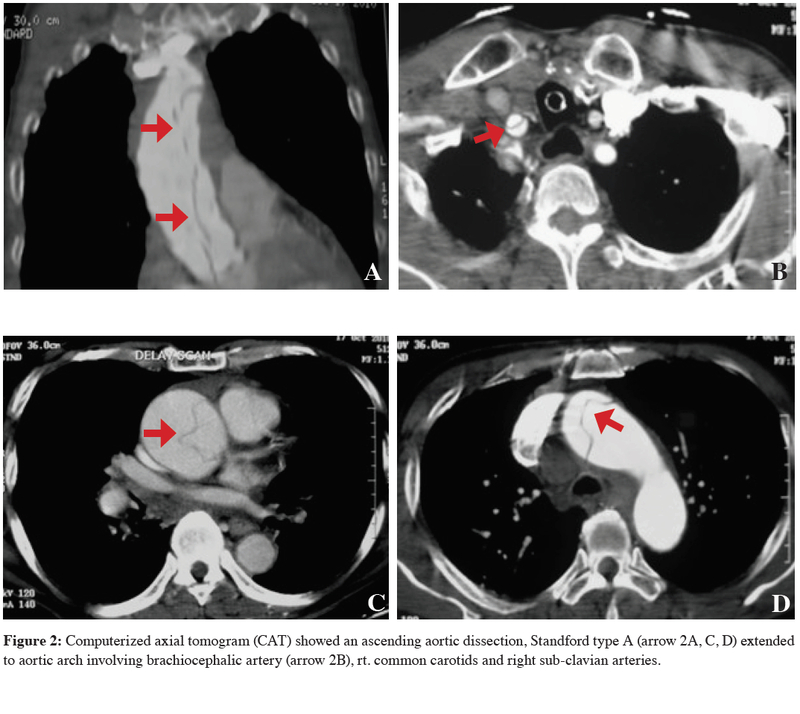 Computerized axial tomogram (CAT) showed an ascending aortic dissection, Standford type A (arrow 2A, C, D) extended to aortic arch involving brachiocephalic artery (arrow 2B), rt. common carotids and right sub-clavian arteries. Computerized axial tomogram (CAT) of case no.2 showed an ascending aortic dissection, Standford type A (arrow A), extending down to iliac artery. The proximal entry site was just above the left main origin (B, arrow). The distal entry site was between innominate and subclavian arteries (C, arrow). The dissection flap compromised the left renal (arrow D) and right common iliac arteries (E, black arrow). 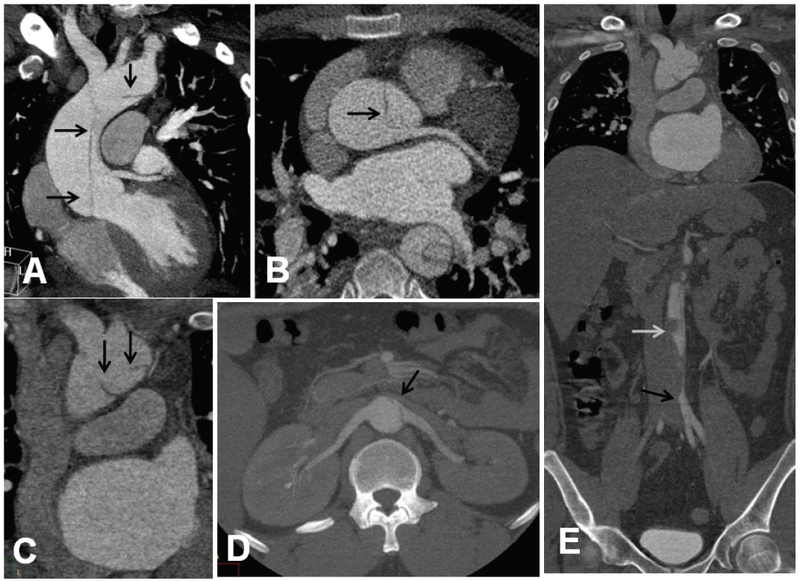 Intramural thrombus was also noted (white arrow, E). A dissected ascending aorta of case no. 2 was shown before (black arrow, A) and after resection with conduit graft replacement (white arrow, B).